SK9822 – a clone of the APA102? Two years ago I took a deeper look into the APA102. Although it was more expensive than the common WS2812, and harder to come by, it had some intriguing properties. The main benefits are a timing-insensitive SPI interface, allowing easy interfacing to standard periphery, and a much higher PWM frequency of >19kHz, making the APA102 almost flicker free. So much about that. Considering how things with LEDs from China go, it should not take too long for clones to appear? Indeed! Recently, several comments showed up on my blog, reporting about issues with APA102 LEDs they bought. It quickly turned out that these were SK9822, APA102 clones from the same company that already brought the SK6812 to us, a WS2812 clone. One of these people was Mike. He developed the Weblight, a WebUSB controlled RGB LED. The prototype (shown below, red pcb) worked well, but when he commissioned a small production run (black pcb), the LED started to show odd update behavior. Mike was nice enough to share a couple of boards with me for further investigation. DICE10 – electronic dice controlled by two GPIO. 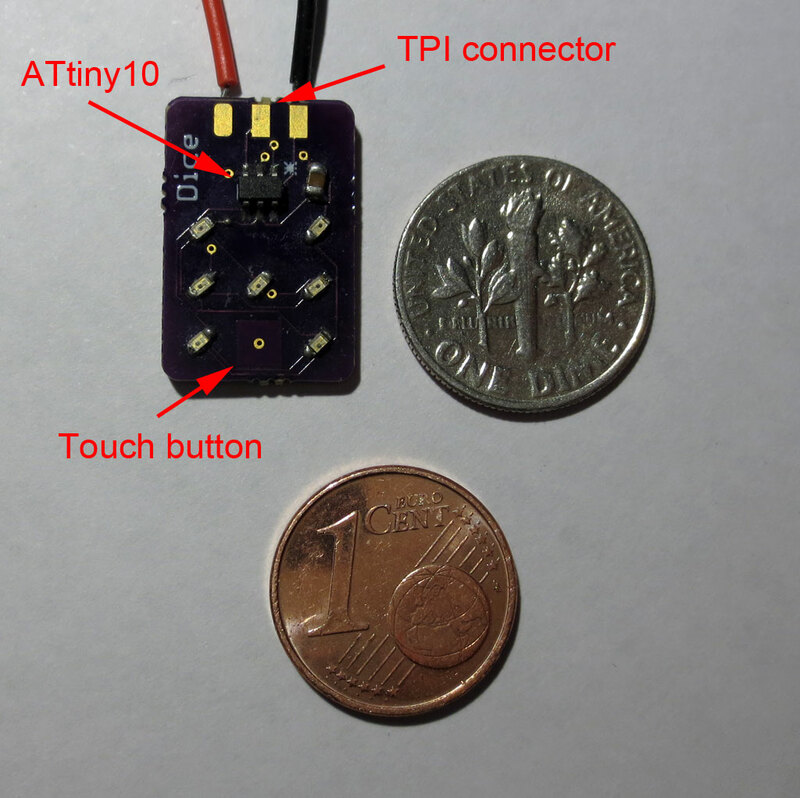 Yay, another mini-project with the ATtiny10! A while ago I devised a scheme to drive an electronic dice with only two IO lines. I finally found the time and motivation to build up a small design using this as an entry for the hackaday 1k compo. Please find project details on the hackaday.io page or the github repository. 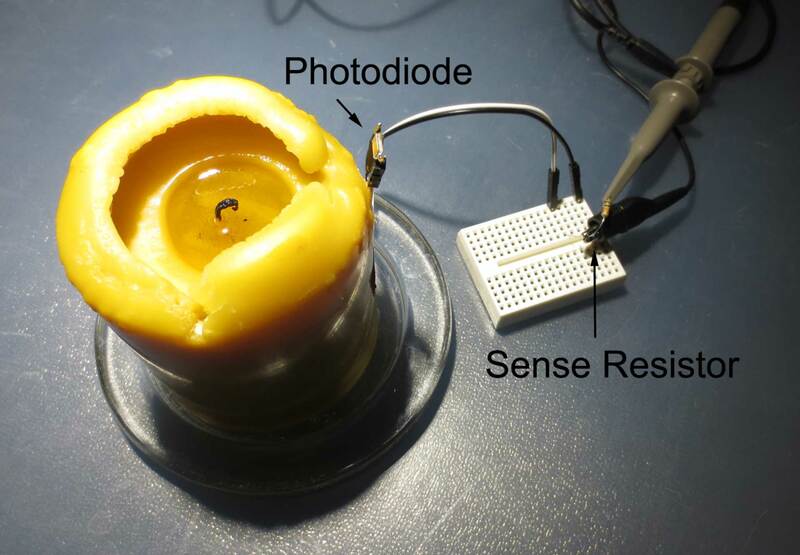 Two years ago, I spent some time analyzing the algorithm used in a candle flicker LED as commonly found in cheap artificial candles. I reverse engineered the algorithm from the flickering pattern and recreated the algorithm in software. Turns out this is of interest for many people who are searching for artificial candle algorithms – there is a surge of traffic every year around December. However, I just reverse engineered one of the controller ICs – this does not mean that this is a good approximation of a real candle. But how to get there? First, we need to understand how a real candle behaves. In a recent comment, Gary made the excellent suggestion to record a real candle on video and analyze the data. I noticed something similar could be done in a very quick-and-dirty way, by connecting a photodiode to a digital storage oscilloscope. How many I/Os are needed to drive electronic dice? I recently bought a very low cost electronic dice kit on an impulse. Assembling it was good retro-fun for a while. The circuit design is was purely 70ies style: A CD4017, a NE555 and a couple of transistors. Of course, this got me thinking: How would it be done today in a most efficient way? Of course this means using a microcontroller, and, of course this means using as few resources as possible. Will an ATiny10 with 3 I/Os pins do? A couple of weeks ago I reported about a new type of RGB-LED with integrated controller, the APA102. One of the interesting new features of this device is a two-wire SPI interface instead of the proprietary one-wire protocol of the more common WS2812. Many microcontrollers have hardware SPI functions, which allow easy control of these LEDs, as opposed to timing critical bit banging. But it turned out this was not the end of the story. As pointed out by Bernd in a comment, there is some discrepancy between the datasheet and the actual behavior of the devices when it comes to the “end frame”. Reason enough to subject the APA102 to more scrutiny. The diagram below summarizes the APA102 protocol as found in the data sheet. Recently, I encountered an interesting problem: How do you measure the length of a WS2812 programmable RGB-LED string electronically? That is, just using signals that are already there. 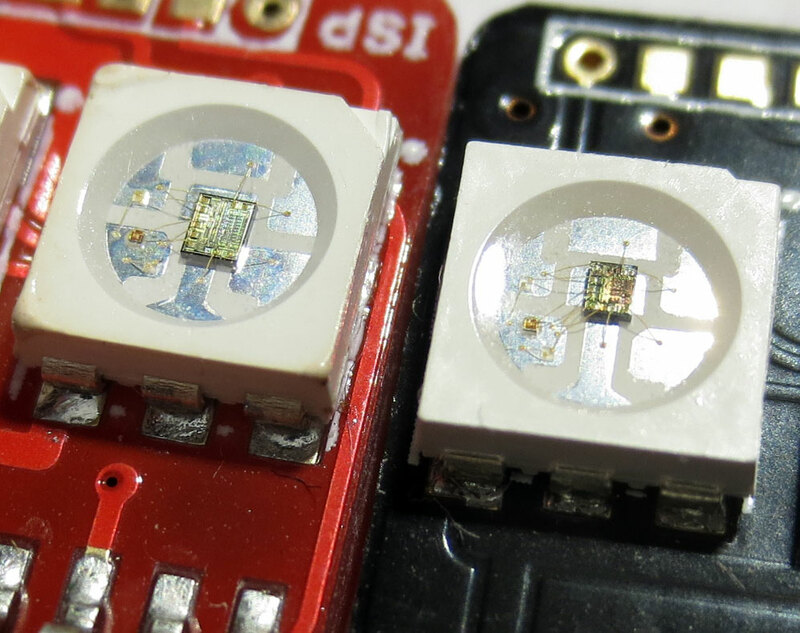 This can be useful if you want a LED controller to adapt its pattern according to the string that is connected to it, or simply for diagnostic reasons. WS2812 strings are usually controlled by using one serial output signal only. The LEDs are daisy chained and you simply push out data for all LEDs without any feedback. If there are fewer LEDs on the string, the data for the last LEDs is ignored. An intuitive approach to counting the number of LEDs is to feed the output of the last LED of the string back into the microcontroller. According to the WS2812 protocol, the output of LED number n is low until data for n+1 LEDs has been pushed to the string. To count the number of LEDs, data is fed to the string until a rising transition is detected on the output. A relatively easy way to implement this is by using a pin change interrupt on the AVR, or a similar feature on other microcontrollers. After clones and variations of the venerable WS2812, there finally seems to be a new RGB-LED with integrated controller that actually improves on several characteristics: The APA102, also known as “Superled”. 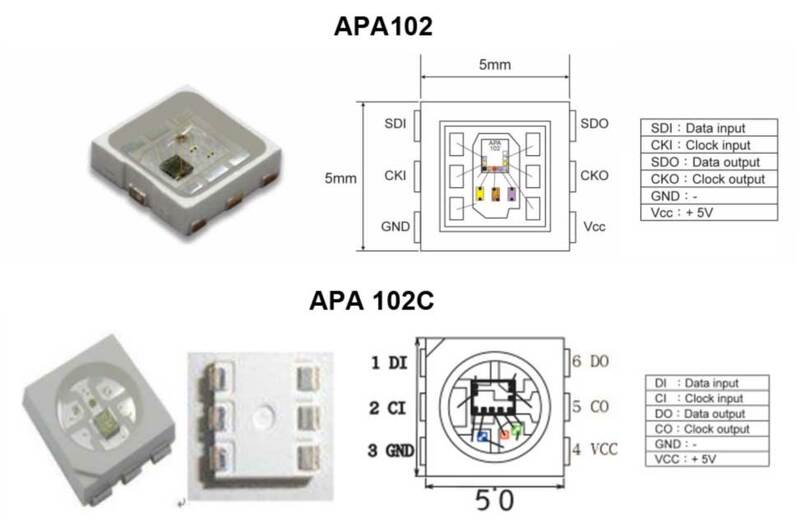 There are two versions on the market, the APA102 and the APA102C, as shown below.